Macleod, R.C.. "Sam Steele". The Canadian Encyclopedia, 04 February 2019, Historica Canada. https://www.thecanadianencyclopedia.ca/en/article/sam-steele. Accessed 25 April 2019. A man of enormous physical strength and endurance, Steele managed to be where the action was hottest (courtesy Library and Archives Canada/PA-28146). Sam Steele was the first child of his father, Elmes Steele’s, second marriage, to Anne MacIan Macdonald. Elmes was a naval officer and politician. His mother died when he was nine and he was raised from that point by his older half-brother, John Steele. He attended school in Orillia, Canada West. Steele wanted to be a soldier from his earliest years. He joined the local militia battalion in his teens and volunteered for the 1st (Ontario) Battalion of the Red River Expedition	in 1870. The expedition was sent to Red River ahead of the transfer of the Hudson’s Bay Company	territory to Canada in 1870 (see Rupert’s Land). Under Colonel Garnet Wolseley were some 400 British regulars and 800 militiamen from Ontario and Quebec. The government tried to give the impression it was not a punitive expedition against Métis leader Louis Riel’s provisional government, but some of the militiamen wanted to avenge the execution of Thomas Scott (see Red River Resistance). The expedition settled in Upper Fort Garry, and Steele was promoted to corporal. He lived in Red River until his battalion was disbanded in 1871. When he returned to Ontario after his year of enlistment, Steele joined the militia’s School of Gunnery at Kingston. When the Canadian government organized the North-West Mounted Police (NWMP) in 1873, Sam Steele was one of the first to join as staff constable (a rank later changed to troop sergeant major). His first important duties came in 1876 and 1877, when he made arrangements for the negotiations of Treaty 6 and Treaty 7	(see also Numbered Treaties). Promoted to sub-inspector in 1878, Steele was given command of “B” Division at Fort Qu’Appelle in 1880. When construction began on the prairie section of the Canadian Pacific Railway	(CPR) in 1882, Steele was put in charge of maintaining order among the workforce. Moving west with the advancing rails, Sam Steele was in the Rogers Pass when the North-West Rebellion	began in March 1885. Steele was recalled to Calgary, where he was tasked with organizing and commanding the scouting contingent for Major General T.B. Strange’s Alberta Field Force. Steele’s Scouts performed well, which led to his promotion to superintendent after the rebellion. The Battle of Steele Narrows (3 June 1885) was the scene of the last shots fired in the North-West Rebellion. Often called the Battle of Loon Lake, it was a minor skirmish between about 65 men under Sam Steele and Woods and Plains Cree retreating after the Battle of Frenchman Butte. At least four Cree were killed, including prominent Woods Cree chief Seekaskootch (Cut Arm). In 1887, Steele was ordered to take “D” Division to southeastern British Columbia, where the provincial government	had mismanaged relations with the Ktunaxa (Kootenay) nation to the point that violence was threatened. Steele’s men built Fort Steele	on the Kootenay River, and he resolved the situation through patient diplomacy with Chief Isadore. The division returned to Fort Macleod in the summer of 1888, and Steele commanded that post, the largest outside NWMP headquarters in Regina, for the next decade. Large gold discoveries in the Yukon in 1896 caught the Canadian government completely unprepared (see Klondike Gold Rush). International press criticism of the chaotic situation there resulted in Sam Steele’s appointment to command a large contingent of 250 NWMP	in the territory. Travelling to Skagway, Alaska, in January 1898, Steele organized customs posts on the Chilkoot and White	passes and introduced regulations requiring incoming miners to bring adequate food supplies to prevent starvation. Moving to Dawson City in the summer, Steele was appointed as a member of the Territorial Council as well as licence commissioner and chair of the board of health for Dawson. He quickly introduced regulations that cleaned up the town and brought a typhoid epidemic under control. Steele arranged for the police to take over the issuance of mining licences and the collection of royalties, processes miners had complained were corrupt. Steele recognized that attempting to prohibit drinking, gambling and prostitution would be futile, so he regulated it, imposing strict closing hours on bars, including all day on Sundays. Most people in Dawson welcomed the changes, but those in the Territorial Council who had benefited from the earlier laxity and corruption had influence in Ottawa. Steele was accused of publicly criticizing the government in Ottawa and in September 1899, he was abruptly ordered to give up his command and return to southern Canada on the first available boat. On arriving in Ottawa, he took a leave from the NWMP. War had broken out by that time in South Africa between the British and the Boer republics of the Transvaal and the Orange Free State (see Canada and the South African War). At the end of 1899, the Canadian government had bowed to public pressure and agreed to send military support to the British. In December, Sam Steele was appointed second-in-command of a unit called the 1st Canadian Mounted Rifles being recruited in Western Canada. Before the CMR was ready to leave for South Africa, the Canadian high commissioner in England, Lord Strathcona, offered to recruit and equip a similar mounted battalion. Steele was offered command of Lord Strathcona’s Horse, and by March 1900 the new unit was on its way to Africa. By the time they got there, the Boer forces had been driven out of Bloemfontein, the capital of the Orange Free State, but refused to surrender. Highly mobile Boer fighters supported by the rural population were able to use the vast spaces of the Transvaal and the Orange Free State to elude the British Army. Under Steele’s aggressive leadership the Strathconas emerged as one of the most successful battalions in this stage of the war, drawing high praise from the commander-in-chief, Lord Kitchener. 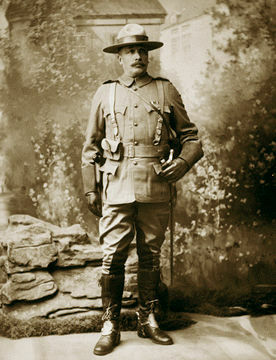 In South Africa, Steele had attracted the attention of Major General Baden-Powell, who was organizing a semi-military police force called the South African Constabulary. Steele was offered command of one of the four divisions of the force. His division covered the area around the gold mining centre of Johannesburg and the Transvaal capital, Pretoria. He stayed in this position until 1906 and returned to Canada in 1907. After a serving in Calgary as commanding officer of Military District No. 13 for a few months, Steele moved to Winnipeg	to head the much larger Military District No. 10. The job mainly involved building up and training Militia units. When the First World War began in 1914, Sam Steele was 66 and contemplating retirement, but his experience and reputation were too valuable to ignore. Once it became apparent that the war would not be over by Christmas, he was promoted to major general and given command of the 2nd Canadian Division, although the British secretary of state for war, Lord Kitchener, had already told the Canadian minister of militia and defence, Sam Hughes, that Steele was too old for an active command. Hughes told Steele that if Kitchener held firm, Steele would be appointed to command the huge Canadian training base at Shorncliffe. When Steele arrived in England, he found that Hughes had already appointed another man to that position. Kitchener resolved the embarrassing situation by appointing Steele as commanding officer of the British Army’s South-Eastern District, which included Shorncliffe. Steele was given a knighthood (KCMG) in January 1918 and officially retired from the army in July. By that time, he was seriously ill with diabetes and his health deteriorated steadily until his death on 30 January 1919. In 1889, Sam Steele met Marie Elizabeth de Lotbinière Harwood, who was visiting her aunt at Fort Macleod from her home at Vaudreuil, Quebec. The two immediately fell in love and married 15 January 1890. In 1891, their first child, Mary Charlotte Flora Macdonald, was born. She was followed by Gertrude Alexandra Elizabeth in 1895 and Harwood Elmes Robert in 1897. Sam Steele was one of the most important builders of Canada as it expanded from coast to coast to coast in the first half century after Confederation. As a military man, he was one of the most capable leaders of Canadian soldiers in the country’s first important overseas conflict (see South African War). His work during the First World War helped lay the foundation for the success of the Canadian Corps. Steele Family Archive, University of Alberta. Sam Steele, Dictionary of Canadian Biography.